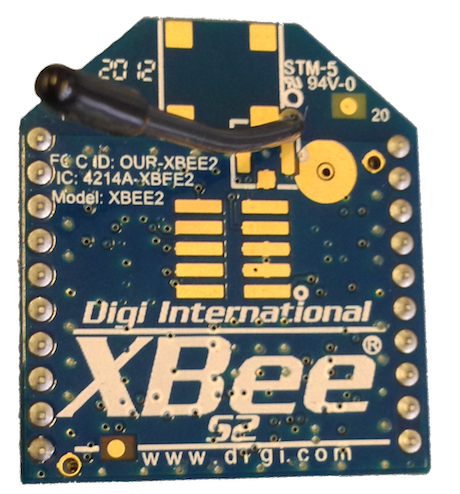 XBee modules come in different configurations. The one we will be using is called XBee Series 2 with wired antenna. It is shown in the image below. Other configurations include older versions, different antennas or connectors, different frequency band, and the "pro" version of the XBee with higher transmission power and subsequent increase in coverage range and energy consumption. This device supports different kinds of ZigBee in mesh networking. Its wired antenna provides omnidirectional coverage, or what is the same as saying that its coverage is pretty much the same in all directions when the antenna is straight and perpendicular to the module. If you flip the XBee over itself, you will be able to see the pins through which it can send/receive data to/from sensors, communicate with Arduino, connections to a power supply and GND. If you require any more information on the XBee, please refer to their website, or take a look at page 15 of (1). In order to communicate with the XBee for configuration you will need a breakout board. 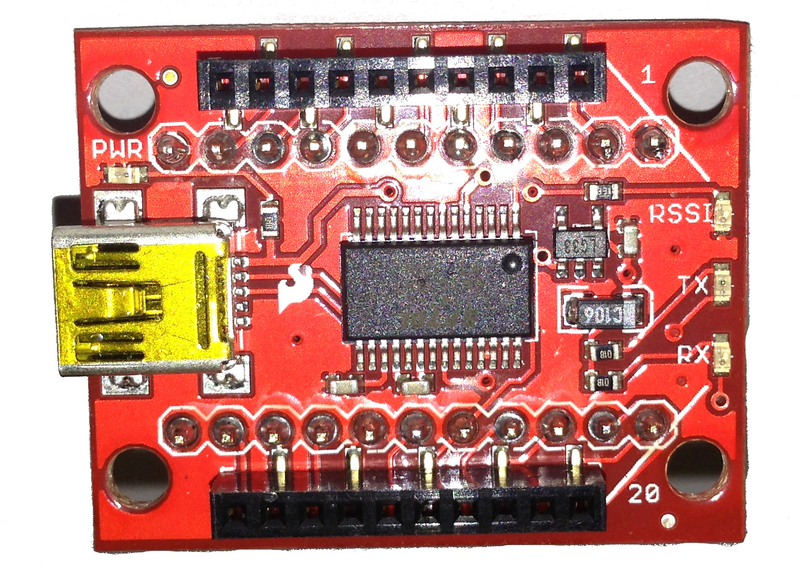 This board facilitates the communication between the XBee and other components, like Arduino or a PC through a USB port. It also provides the appropriate pin separation for including the XBee into breadboard circuits. 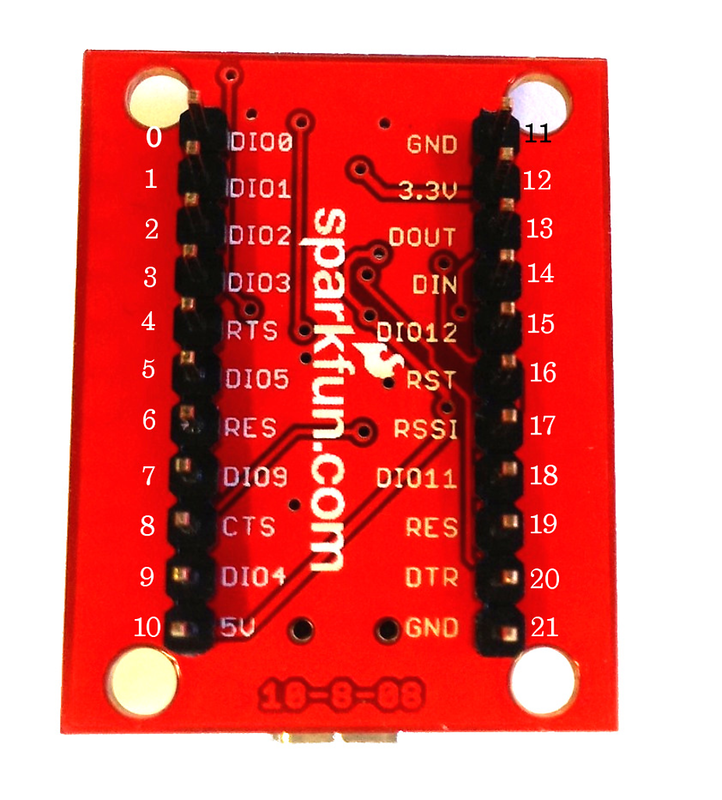 The image below provides an overview of a SparkFun breakout board called Explorer. Once the XBee is placed on the breakout board pins functions change, as it is shown in the image below. The XBee has a microcontroller running a configurable firmware. This firmware holds the necessary information for addressing, communication, security and utility functions. You can configure this firmware to change different settings, like: local address, security settings, destination address and how the analogue sensors connected to the XBee's pins are read. The official way to configure the firmware is through a Digi's X-CTU program. It runs only on Microsoft Windows, nevertheless, the course guide provides useful information on how to acquire and install it on the most common operating systems. (1) R. Faludi. Building Wireless Sensor Networks: with Zig-Bee, XBee, Arduino, and Processing. O’Reilly Media, Incorporated, 2010. Activity: Try to find information about the meaning of the pins of the XBee and explain which is your favorite pin and why.